The third and final debate between President Obama and challenger Romney was so lacking in real and relevant substance about foreign affairs that I had to struggle, several times, to resist the temptation to turn it off and go back to bed. “Mitt Romney has nothing really coherent or substantive to say about domestic policy, but at least he can sound energetic and confident about it. On foreign policy, the subject of Monday night’s final presidential debate, he had little coherent to say and often sounded completely lost. That’s because he has no original ideas of substance on most world issues, including Syria, Iran and Afghanistan. During the debate, on issue after issue, Mr. Romney sounded as if he had read the boldfaced headings in a briefing book – or a freshman global history textbook – and had not gone much further than that. Twice during the first half-hour, he mentioned that Al Qaeda-affiliated groups were active in northern Mali. Was that in the morning’s briefing book?” (I would be very surprised if Romney knows where Mali is). 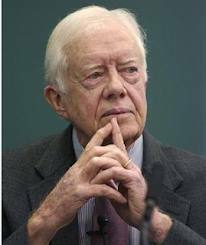 The truth telling about the most critical and dangerous problem in the Middle East and arguably the whole world (the Israel-Palestine conflict) was left to former President Carter. What a tragedy it is that American presidents can only speak the truth when they are out of office.